Plön is a town in Schleswig-Holstein, the northernmost state of Germany. As for most places of Germany, Plön is connected to an extensive network. Regular (once a hour 5am-1am) trains leave from Kiel and Lübeck. If you are traveling by car, you should head towards Kiel or Neumünster (from the north / Denmark) and follow the federal road B76 (from Kiel to Lübeck) or B430 (from Neumünster to Plön). From the south, head for Hamburg and continue to Lübeck, than just follow the B76 towards Kiel. There are several daily connection from Kiel, Lübeck and Neumünster as well as many regional villages and cities. The operator is Verkehrsbetriebe Kreis Plön (VKP) or Autokraft. The closest airports are Hamburg and Lübeck (European routes only). Plön is small enough to easily walk or bike around town. 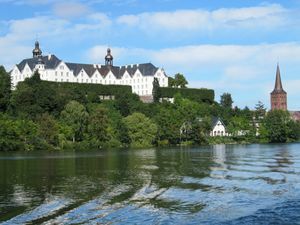 Plön is famous for its lakes, which essentially surround the city. There is a 17th century mansion ("castle") on a hill at the center of the city. The old and charming little Johanneskirche (church) is worth a visit as well as the Parnassturm (tower), which offers a scenic view of the city with its surrounding landscape and lakes. There are also good walking trails and a hike to "Prince's Island" is a scenic day walk. Another interesting work is around the Trammersee (lake) to the cities north. Through the 2h walk, you will pass through small villages, forests and scenic landscapes. The Altes Fährhaus  is both a restaurant and a hotel on the shore of the largest lake. Eisenpfanne is a nice, general menu, steak-n-potatoes/pizza restaurant in the middle of the old town. This page was last edited on 14 September 2015, at 08:48.